With hectic schedules, busy families, financial pressures and life's many complications, stress can permeate every aspect of daily living. Whether you're experiencing more persistent stress or just looking to enjoy the many health benefits of increased relaxation, music can play an important role. It has the power to engage the body, mind and spirit and carry you into a more relaxed state. Listening to music may evoke memories, images or scenes. This is how music soundtracks help "tell" the story of a movie. We can all intentionally create soundtracks for our lives, and music therapist Jennifer Buchanan guides us in doing just that in her book, Tune In: Use Music Intentionally to Curb Stress, Boost Morale and Restore Health. Buchanan says that by choosing to listen to music that you associate with calming memories, images or scenes, you can distract yourself from the negative thoughts that are worrying you. Music can also help engage your creative, problem-solving mind so that you can come up with constructive solutions for the worrisome situation. Purposefully chosen music can also evoke the physical sensations of actually being in those relaxing scenarios. Whether you're lying down and listening to a slow-paced symphony, or letting loose on the dance floor to a loud, thumping beat, music can give you a physical release from stress. Attending a concert, creating live music with a group of people, or even singing along with the radio can help us to feel connected to a world outside ourselves, and sometimes to a deeper spiritual presence. Indeed, music has a major role in most of the world's religions. Although the use of music as a healing modality dates back to the writings of Aristotle, music therapy was first identified as a profession following WWI and WWII when it was used with veterans who had a variety of issues, including PTSD (post-traumatic stress disorder). In her book Tune In, Jennifer Buchanan shares the story of her first meeting with a music therapy client with PTSD. Before they met, he had closed himself off from the world and spent most of his time in his room. When he first met Jennifer and listened as she sang familiar songs (just one of the many ways that music therapists use music to enhance the health and well-being of their clients), the experience brought a spark of life back into his eyes. Soon, he was expressing that aliveness in other ways, by expanding his activities and more closely interacting with the people around him. When it comes to relieving stress, Buchanan says that it's not the speed of music that is the key—for some people, it is fast music that is relaxing—but finding your own personalized music prescription for stress. 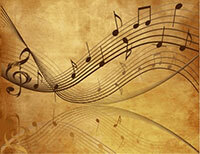 She suggests that you first identify which style, speed, instrument or voice seems to soothe you. 1. Find a comfortable place to sit or lie down near the speakers, or wear a comfortable pair of earphones. 2. Turn on the music, ensuring that the volume is high enough to capture your attention yet low enough to not hurt your eardrums. 3. Take a few minutes to observe your breathing, shifting your mind from the external to the internal. 4. Turn your focus entirely to the music and hold it there. Follow the melody, or pay attention to the pauses in the music. If you find yourself drifting away, gently bring yourself back to the sound. Music is my favorite but there are other healthy ways to soothe yourself from stress.